Arlene Notoro Morgan is co-editor of The Authentic Voice and Special Assistant to the Dean for External Affairs at Temple University School of Media and Communication. She served as Associate Dean for Prizes and Programs from 2000-2013 at the Columbia University Graduate School of Journalism. Prior to joining Columbia University, Morgan was at The Philadelphia Inquirer for 31 years, and served as an Assistant Managing Editor for Hiring and Staff Development. In that position, she led the newspaper’s diversity initiative and did training for Knight-Ridder newspapers, winning the first Knight-Ridder Excellence Award for Diversity in 1995. She holds certificates in several training programs, including the Maynard Institute for Journalism Education, Kochman Communications and Zenger-Miller. Morgan describes The Authentic Voice as an outgrowth from requests from journalism educators and diversity trainers to fill the void in teaching materials regarding journalism, race and ethnicity. Alice Irene Pifer is co-editor of The Authentic Voice and a freelance journalist who has taught journalism courses at Columbia University’s Graduate School of Journalism and New York University. She has also twice been a visiting faculty member at the Poynter Institute for its “Writing About Race” seminar. 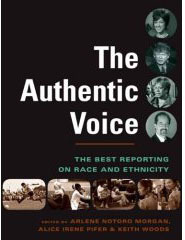 Pifer was a producer at ABC News for 20 years, where she reported regularly on race for the news magazine “20/20.” Her 2000 story, “The Family Secret,” included in The Authentic Voice, received four awards, including the 2001 National Association of Black Journalists First Place Award. Pifer served on the advisory board of the “Let’s Do It Better!” award and workshop for excellence in reporting on race and ethnicity from 2002 to 2008. She began her career at CBS News and has won numerous awards, among them two Emmys, for her reporting on a wide range of topics including race, health, science, human rights and social issues. Pifer was a Nieman fellow at Harvard University in 1995-96. Dolores Barclay is the Arts Editor of the Associated Press. She joined AP in 1971 as a reporter, covering city hall, federal and criminal courts, and the police beat for the New York bureau. She took a leave from editing to work on “Torn From the Land,” which was awarded the Aronson Prize for Social Justice Journalism, the APME Enterprise Award, and the Griot Award of the New York Association of Black Journalists. Bruce DeSilva is the writing coach for the Associated Press responsible for training AP staff worldwide. Previously, he directed the AP’s News/Features Department, which specializes in national enterprise including investigations, explanatory journalism and narrative storytelling. He has worked as a consultant on writing and editing for more than forty newspapers. For more than eighteen months, reporter Anne Hull of The Washington Post went looking for the new America that is emerging from large-scale immigration. Her four-part series, “Rim Of The New World,” was a 2003 Pulitzer Prize finalist in national reporting. Hull is a four-time Pulitzer Prize finalist and a two-time winner of the prestigious American Society of Newspaper Editors Distinguished Writing Award. Hull began her career at the St. Petersburg Times in Florida, where she grew up. She was a Nieman Fellow in 1995 at Harvard University before joining The Washington Post in 2000. Hull’s newspaper stories have been anthologized in ASNE’s Best Newspaper Writing in 1994, 2000, 2001 and 2002. Todd Lewin has been a correspondent with the Associated Press since 1988 and worked as an editor on AP’s international desk, and as a national features writer. He is the author of “The Last Run: A True Story of Rescue and Redemption of the Alaska Seas.” In 2001, he shared the Aronson Award for Social Justice Journalism for the “Torn From The Land” series with Dolores Barclay and Allen G. Breed. Elizabeth Llorente is a senior writer at The Record in Hackensack, N.J., where she has specialized in covering immigration and ethnic communities. During that time, Llorente has gained national recognition for her coverage, which includes stories on the abuse of immigrants in federal detention centers and an investigation of a driver’s license black market in New Jersey that preyed heavily on immigrants. Stephen Magagnini has won national recognition for a decade of covering race issues and ethnic communities for The Sacramento Bee. Among his honors was an award for distinguished writing about diversity from the American Society of Newspaper Editors for “Orphans of History,” a series published in 2000 on Sacramento’s Hmong community. Jodi Rave is a national reporter and columnist who covers Native American issues for 58 newspapers in 22 states for Lee Enterprises newspapers. Rave started working out of the Missoulian newspaper in Missoula, Mont., after completing a 2004 Nieman fellowship at Harvard University. She won the 2002 Thomas C. Sorensen Award for distinguised Nebraska journalism for the “Broken Trust” series, written when she was assigned to Lee’s Journal Star in Lincoln, Nebraska.